The City of Traverse City retrofitted four runoff outfalls in the vicinity of Hannah Park with devices that utilize “swirl” technology to remove a large portion of sediment and petroleum-based products such as oil, gas and grease from runoff. 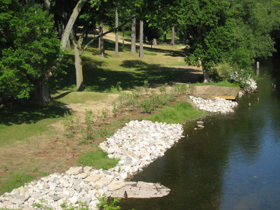 Vegetative buffers are extremely important along rivers and other waterways to reduce the impacts of pollutants in runoff and to provide bank stabilization. Previously, the park had mowed grass up to the edge of the river bank, and several areas of the streambank were eroding into the Boardman River.